As the media world grows increasingly digitized communicators struggle to protect their intellectual property. What is considered intellectual property and how do we go about protecting our works? 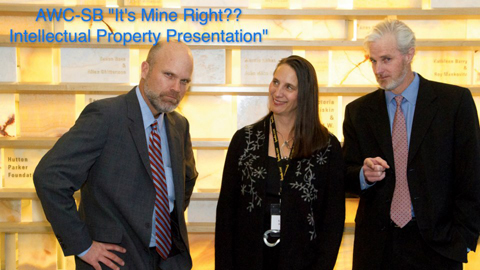 Attorneys Mike Velthoen and Jim Q. McDermott of Ferguson Case Orr Paterson LLP discussed these questions and others pertaining to copyright and trade secrets at AWC-SB’s March 6th presentation, It’s Mine! Right??? Protecting Your Intellectual Property. Intellectual property, as with other forms of ‘property’ says Mike Veltheon, Managing Partner, is best thought of as a “bundle of rights.” We have the right to control the use of, the right to benefit from, the right to transfer or sell, and the right to exclude others from our intellectual property. The challenge is determining if another person can enjoy the same rights and maintain ownership over an idea, when their idea is similar to yours. Mr. Velthoen discussed several different forms of protection available to safeguard the various types of intellectual property that exist. For example, patents grant a legal monopoly over the use of an invention for 20 years. However, all inventions protected by a patent must be disclosed to the public. This concept is referred to as the “patent bargain.” Examples of patentable inventions include novel machinery, manufacturing processes, and ways to compose matter. Mike Veltheon also expanded on the topic of trade secrets which he defines as “any piece of information, such as a formula, pattern, customer list, method, or technique, that is of economic value, is not generally known by others, and is the subject of reasonable efforts to maintain its secrecy.” Trade secrets, unlike patents, are protected for an unlimited duration, but do not grant a monopoly to the inventor and are not protected against reverse engineering, which signifies other individuals are allowed to invent the same idea if they can figure out how it is made. AV-rated civil litigation attorney Jim Q. McDermott opened up with a discussion on copyrights and trademarks. Copyrights, Jim states, are used to protect any original idea or creative work that is fixed to a tangible medium. Examples include a book, work of art, or a photograph. Trademarks are defined as any “words, designs, or symbols that identify a good or service as coming from a particular person or company.” According to Jim, the strongest trademark is one that does not actually describe the product. This can make it more difficult to market, but it helps to differentiate from similar product offerings and provides the company with a certain unique distinction. The expert attorneys concluded their presentation with a real world litigation dispute between companies Mattel, Inc. and MGA in which Mattel sued a former employee for inventing a doll similar to the Bratz dolls (are you sure this is correct?) after leaving the company. Although the courts Mattel initially granted Mattel rights to the Bratz dolls, and awarded a settlement, MGA and the creator of Bratz dolls appealed the case and received a $175 million settlement in the end. Mike Veltheon and Jim Q. McDermott’s case story highlighted the significance of knowing what exactly intellectual property is and how vital it is to protect your rights. This entry was posted in Featured, Past Events on April 2, 2013 by Lisa.